I've been telling myself I'd do something like this for a long time. Can you say "procrastination"? I wrote the book on the subject. I've been into photography since taking classes in high school, where I learned the basics of black and white photography. I always enjoyed my time in the darkroom. It was always very relaxing, rather "zen" like, to me. That was a long time ago, though, with quite a few inactive years between then and now. A little over a year ago I came across a site called DPChallenge (my user name there is error99) that rekindled that "photo bug" inside me. Since then, I've been dabbling in photography again (more off than on for various reasons) and now feel it's time to shift from neutral to drive. If all goes as planned I will be posting at least one photo a week that I'm not too embarrassed to put my name on. Who knows where this ride will take me? I hope to learn a lot. Not only about photography, but also, about myself. i love the detail on the door... i'd be curious to hear more about the processing. i grew up in a small town in the midwest, so i'm really looking forward to your year of images surveying central iowa. The grain on those walls is really stark. I like the image alot. Thanks for the comments. It was shot in RAW. After conversion to .tif I used channels in PS5 for bw conversion. I then messed around with different degrees of pretty agressive usm to bring out the grain more. 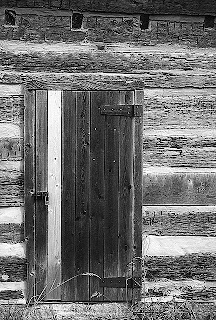 I love shooting old wood and doors. Nice B&W image - I really like the tones and how you can see the grain in the wood.